Lauren Moffit is privileged and overprotected by her wealthy parents. She is one of the few African American students in a prestigious prep school in a predominately white neighborhood. The world is her oyster. Nothing can prepare her for the devastating scandal that rocks her world when her father is charged with investment fraud. Spoiled and self-centered, she struggles to keep her head high. 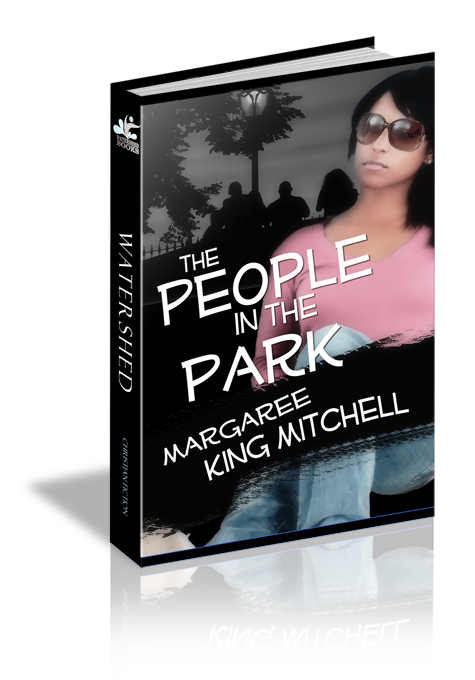 But it's not until she hears the stories of the people in the park, where she takes her daily run, that Lauren realizes she can rise above her family "situation." I had my front-page story, finally! I talked to the majority of junior and senior students and after two years and one semester of working on the school newspaper, I had a front-page story. “Students Travel the World for Prom Attire” by Lauren Moffit. My schoolmates proudly told me where they were shopping for their prom dresses, from the salons of Paris to designer showrooms in New York, from private dressmakers in Kansas City to vintage clothing stores online, everybody was excited to share their dress plans for that special evening. Me? I was going to Chicago to shop with my cousin Tiffany, along with Mom and Aunt Ira, of course. The newspaper rested in the passenger seat of my car as I entered my neighborhood. Mom and Dad would be so proud. Ever since I joined the newspaper staff my freshman year, Mom had said it would only be a matter of time before I was writing front-page stories. A sidebar in my story featured the boys, some of whom had plans for their first custom tailored tuxedos. They were going to their fathers’ tailors for measurements now, in order for the tuxedos to be ready by prom. When your family had gazillion dollars, getting a tuxedo from a rental shop wasn’t an option. At least three quarters of the boys planned to purchase their own tuxedos, even if only from a department store. I pushed open the mudroom door. Mrs. Robinson, our cook, had the week off, cruising the Caribbean with her sister. Usually when I reached this area, smells of dinner wafted from the kitchen. Today I didn’t smell anything, which was unusual because on Mrs. Robinson’s days off, Mom took over and cooked favorite meals from her childhood. Being in the kitchen was natural for her, having been taught by my grandmother to cook up a batch of collard greens, pork chops and gravy, fried corn, salmon croquettes with rice, fried chicken, barbecued deer ribs, macaroni and cheese, black-eyed peas, fried okra, you name it, Mom could cook it. Sharing meals from her childhood was her way of keeping me in touch with my African American heritage, since otherwise I didn’t come in contact with many black people in Fairfield. None of the familiar smells greeted me today. Maybe we were going out to dinner. I knew something was wrong when I walked into the kitchen and saw big ugly tears flowing from Mom’s eyes as she sobbed uncontrollably. She quickly wiped her eyes. Without saying a word, she beckoned for me to sit down at the table with her. With my eyes, I questioned her. But she didn’t say anything. Instead, she grabbed the TV remote and pointed it at the television set that was mounted on a wall in the kitchen. I sat there mesmerized as the news anchor said, “Peter Williams, Founder of Williams Ortiz L.L.P., was arrested this morning. He is accused of bilking clients out of millions of dollars. An early estimate puts the figure at $300 million. Arrested along with him were other top officials of the law firm, including Samuel Ortiz, Chief Financial Officer, and Roger Moffit, Managing Director. It is not clear the role they played in the fraud, what is known…” the anchor continued. But my mind stopped when the reporter said Roger Moffit. My Dad. Roger Moffit. It couldn’t be. There had to be some mistake. Roger Moffit, who always taught me right from wrong. Roger Moffit, who always told me that stealing is wrong. Not that Roger Moffit. It must be somebody else. I sat there in a stupor. Mom reached out her hand and touched mine. Bail. Roger Moffit. Those words did not belong in the same sentence. As I processed the breaking news on TV, I switched to HLN and saw the same thing. MKMBC, KLMBC, Midwest Business, all the channels carried the same news. Then the telephone started ringing. Grand Meré called first. Mom talked to her and said all the right words. Dad was innocent. He would never do what they were accusing him of on TV. Grand Meré and Granddad, Mom’s parents, lived in Memphis. If they had heard, the whole world had heard. My life was ruined. How could I go back to school tomorrow? Ever? Then reporters started calling. Mom didn’t answer the phone, letting all calls go to voice mail. She didn’t even want to talk to her friends. I could see the fear in her eyes. I couldn’t comfort her. She was supposed to be comforting me. Instead, we just sat there staring at the TV, not saying a word. Mom had muted the voices when Grand Meré called. The voices of the people on the screen were still muted; their faces contorted as they worked their mouths and smirked as they rehashed the story over and over. My newspaper story didn’t seem important anymore. I didn’t even mention it to Mom, even though it lay on the table. We heard Dad’s car when he entered the garage. We waited for him to come through the door and make everything all right. Dad enveloped Mom in his arms when he came into the kitchen. He took one look at the flickering images on the TV and turned it off. He led Mom back to the kitchen table where I sat. He pulled out a chair between us. “I did not do what they are saying,” he said. What a relief! It felt like a big weight had been lifted from one side of my body. But the other side still had a heavier weight — Shame. How could I hold my head up at school tomorrow knowing my Dad’s picture was broadcast all over the world as being a crook? There’s no way I could go back to school. But my friends were there. What would they think? I was planning to run for treasurer of my senior class. The election for next year’s officers was in a few weeks. “This is so messed up,” I cried. Kitten. My Dad’s pet name for me. Whenever he used to call me kitten I always felt better. Not this time. “Why are they saying those things about you?” I asked. “Can’t you clear your name?” Mom asked. Somehow I knew I wasn’t going to like what came after but. He looked at Mom and he looked at me. I could see the pain in his eyes. One hundred dollars a week? That was nothing. I couldn’t get by on one hundred dollars a week. “What about our house?” Mom asked. I heard something in her voice I hadn’t ever heard. It scared me. I wanted to hear Dad’s answer, yet I didn’t stick around. I went to my room and closed the door. My iPhone was filled with text messages from my friends. I couldn’t bring myself to look at them. I flopped down on my bed and just lay there. Numb. This evening wasn’t supposed to turn out like this. We should be celebrating my front-page story. The newspaper with my story came out this morning and the story about Dad’s firm came out this afternoon. How ironic was that? My day of glory had turned into a nightmare. Suddenly my pity party was interrupted by the sound of the doorbell. Since Mom wouldn’t answer the phone, the reporters must be trying to get a face to face comment from us. What nerve! Reverend Jones is the pastor of a small church across the river in Kanas City, Kansas that Dad attended sometimes. Easter was the only time Mom and I went there and that’s only because Dad awarded us with brunch on the Plaza afterwards. Mom called Reverend Jones a “jackleg preacher” because he has no seminary degree, but he still goes by ‘Reverend Doctor Jones’ because of his honorary degrees. I was too busy laughing at how he talked and acted to pay attention to his sermons. I rolled my eyes as I walked down the steps. I certainly didn’t feel like praying and from the look on Mom’s face, she felt the same. Our world had been turned upside down and we didn’t feel like hearing some long, drawn out prayer from some tired preacher. “I called Reverend Jones on my way home. I know we don’t go to church as we should, but he was still willing to come and pray with us,” Dad said. We then all held hands and Reverend Jones prayed, “Our great and mighty God, ruler of heaven and earth. Lord, I lift up this family to you tonight. Heavenly Father, a day that started on a mountain top full of sunshine and brightness for them has ended in a valley full of darkness and despair. Lord, help them understand that you have not forsaken them. Strengthen them Father, as you lead them through this storm. I pray that Brother Moffet’s innocence will be proven. Give his wife and daughter the faith to see that this will pass and the sun will shine again in their lives. In Jesus name we pray, Amen. I turned towards Mom. I felt no different than before our visit from the Right Reverend Doctor Jones. She didn’t appear to feel any different either. Mom and I ate dinner together, mainly in silence. Dad was in his study, on the phone with lawyers. She had ordered pizza because she wasn’t in the mood to cook. Then she had felt sorry about doing that, saying she had to stop being frivolous with money. We had never had to be concerned about money ever in our lives. This had to be a horrible nightmare. I felt bad that Mom felt guilty about spending twenty dollars for a pizza. We couldn’t even enjoy it because now spending money was somehow forbidden in some unwritten rule that had invaded our lives today. I cried myself to sleep. No homework. No nothing. Sleep blotted out everything about today. If I could only sleep forever, maybe the pain would go away, and along with it the shame I felt. Even though I had done nothing but live and exist in this family, my entire world was shattered.